as the topmost judge for almost eleven months to retire on December 20 this year. and is formally sworn in as such after the superannuation of the incumbent chief justice. general of police (IGP) of Balochistan Tariq Masood Khosa. at Punjab University and secured first position. He secured a National Scholarship Award as well. He did his masters in English Language and Literature at the University of the Punjab in 1975. Iftikhar Muhammad Chaudhry, and many other senior judges, refused to retake the oath. 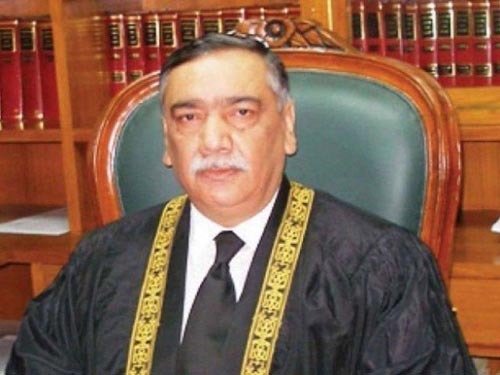 February 18, 2010, Justice Khosa was elevated to the position of a Supreme Court judge. Yousaf Raza Gillani’s contempt of court case. Nawaz Sharif from running for office. and last year in October, he was part of the bench that acquitted Aasia Bibi. replace him to continue in the top position for some nineteen months till August 16, 2023.
berth for over two years till November 26, 2027.